Issued on 12th April 1933, this set of three stamps marked the opening sitting of the new Reichstag – though the institution was itself by that time little more than ceremonial, if that. The famous Reichstag building was never actually used during the National Socialist era, having caught fire on 27th February 1933 in highly controversial and suspicious circumstances. The man charged with the crime was the twenty-five year old unemployed bricklayer and Dutch Communist Marinus van der Lubbe, but the extent of his involvement has to this day never been properly established; while the Nazis pointed the finger at the communists, the communists chose to distance themselves from the young Dutchman by suggesting that he was little more than a “half-wit” manipulated by the Nazis. In spite of the fact that van der Lubbe claimed to have acted alone in causing the blaze, the Nazi propaganda mouthpieces used the incident to suggest the idea of a wider communist plot – which in turn provided the recently-elected Chancellor Adolf Hitler with the perfect opportunity to tighten his grip on power through the Reichstag Fire Degree which was almost immediately approved and signed into law by the ailing President Paul von Hindenburg. At the time of the printing of these commemorative stamps, Reichstag sessions were instead held in the nearby Kroll Opera House (Krolloper). 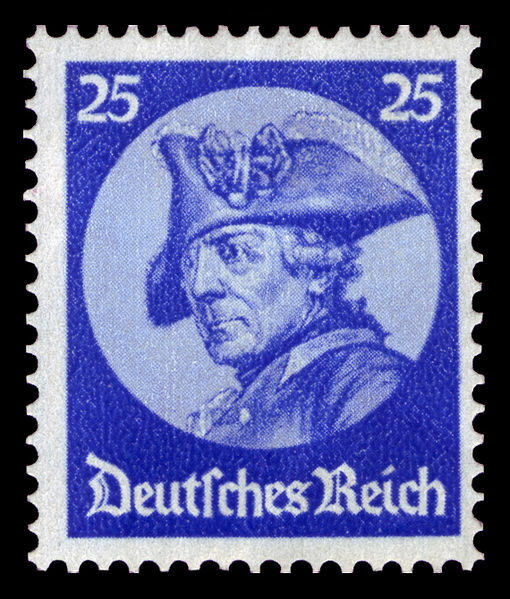 The three stamps came in values of 6, 12 and 25 Reichspfennig, and featured the famous sketched portrait of Hohenzollern king Frederick II – also known as Frederick the Great (Friedrich der Große) by the nineteenth-century artist Adolph Menzel. Each stamp has the Waffeln (“waffle”) watermark. This is one of the rarer Third Reich period sets, with the bulk of the value being in the 25 Rpf. dark lilac-ultramarine. The black-green 6 Rpf. value contains a rendition of Adolph Menzel’s sketch of Friedrich der Große within a pale green disc. The dark rose-red 12 Rpf. value contains a rendition of Adolph Menzel’s sketch of Friedrich der Große within a pale rose-pink disc. The dark lilac-ultramarine 25 Rpf. value contains a rendition of Adolph Menzel’s sketch of Friedrich der Große within a pale blue disc. The son of King Friedrich Wilhelm I of Prussia and Sophia Dorothea of Hanover, Friedrich was born in Berlin 24th January 1712 as Crown Price, and ascended the Prussian throne as Friedrich II on 31st May 1740. With the Prussian kingdom spread across a number of small and somewhat disparate territories, Friedrich was initially known as King in Prussia – which was altered to King of Prussia in 1772. Although he would later turn into one of Prussia’s – and Germany’s – greatest rulers, things may not have turned out so successfully for Friedrich had both his father and fate taken a firmer hand. A dispute with his father Friedrich Wilhelm had led the Crown Prince to engineer an escape to Great Britain in August 1730 at the age of eighteen, which ended in Friedrich’s capture and the execution of his childhood friend and co-conspirator Hans Hermann von Katte. The authoritarian king had considered both executing his son as a traitor and forcing him to renounce his succession, but pardoned him in November; very slowly the chill in the relationship began to thaw, and Friedrich’s military rank was also eventually restored. In 1733 Friedrich was married to Elisabeth Christine of Brunswick-Bevern, but like many royal marriages at the time it was motivated more by convenience than anything else. The Crown Prince’s new wife was a relative of the Austrian Habsburgs, and the union little more than a political agreement. There was little in common between the two, and when Friedrich ascended to the throne in 1740 the queen was effectively banished to Schönhausen Palace while the King remained at his Potsdam residence “Sanssouci”. As king Friedrich II set about on his mission of unifying and modernising his kingdom. At the sharp end of his sword was Austria, though Silesia, Saxony and later Poland also fell prey to an increasingly strong Prussia. Facing enemies on almost every border, Friedrich forged an alliance with Britain; he was highly praised for his military tactics and political awareness, and more often than not led from the front in battle. 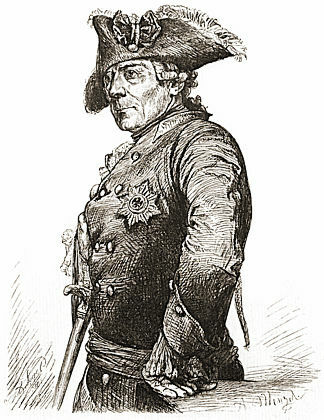 In just over thirty years Prussia had been transformed from a collection of provincial backwaters into a politically stable state, and in 1772 after the aquisition of Westpreußen Friedrich was finally able to claim the title King of Prussia – König von Preußen. In addition to his military success, Friedrich also drove and oversaw dramatic social and economic change in a country to which he was clearly devoted. From the building of new canals and food distribution through to educational reform and the restructuring of the tax system, the king had set Prussia on a path of rapid advancement, to the point where it began to see itself as a genuine rival to Europe’s other great empires such as Britain, France and Russia. Friedrich’s attempts to modernise and develop his kingdom didn’t stop at that: torture and capital punishment were abolished, religious freedom was encouraged, and immigrants with specific skills were openly invited to play their part in this development. The overriding factor in all of this was improvement: where an individual or group could in some way improve the country, they were supported and encouraged whether they were Silesian Jesuits, Bohemian weavers or Jewish merchants. The king was a figure of Prussia’s new enlightenment even on a personal level: he was a gifted musician and composer, spoke a number of European languages, and wrote numerous philosophical pieces modelled on the writing of Voltaire with whom he had corresponded at length. When he died in August 1786 at the age of seventy-four, he left behind the country that had witnessed remarkable change: it is for good reason that he was henceforth known as Friedrich der Große. The only thing that remained was the absence of a natural heir, though this was hardly surprising given that Friedrich and his wife lived separate lives, meeting only at occasions that demanded their presence. Friedrich was buried on the grounds of his favourite residence Sanssouci, but both his body and that of his father Friedrich Wilhelm were distinterred on Hitler’s orders at the end of the Second World War lest they fell into the hands of the Soviet Red Army. After Germany’s surrender both kings were buried in the Burg Hohenzollern south of Stuttgart, but in 1991 – two years after unification and 205 years after his death – Friedrich’s body was finally returned to its original resting place along with that of his father. 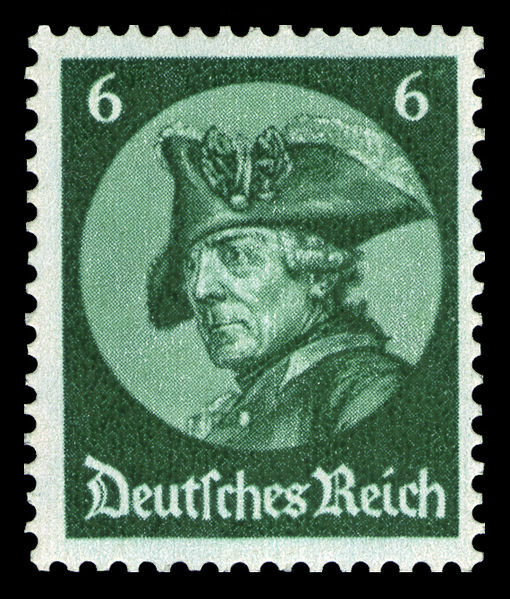 The image of Friedrich der Große as an enlightened moderniser does appear to fall a little out of sync with his appearance on the first set of Nazi-era stamps, though it is obvious that to the Nazis Prussia’s greatest monarch was worth his weight in historical gold for his military achievements alone. That said, it is somewhat ironic to think that a portrait of this great reformer could have been found on the wall of Hitler’s Berlin bunker in 1945. Adolph von Menzel was born in Breslau (now Wrocław in Poland) in December 1815, twenty-nine years after the death of Friedrich II. Menzel was considered one of the greatest German artists of his time, though these days he is perhaps less well known outside Germany than his contemporary Caspar David Friedrich. That Menzel is largely unknown internationally probably had much to do that many of his works featured political subjects and ended up in German museums rather than in the coffers of international collectors; Friedrich der Große was a figure that featured heavily in Menzel’s portfolio: having initially provided illustrations for Franz Theodor Kugler’s Geschichte Friedrichs des Grossen (“History of Frederick the Great”) between 1839 and 1842, Menzel illustrated further works on Friedrich II and his armies. Between 1843 and 1849 at the behest of King Friedrich Wilhelm IV (the grandson of Friedrich II’s nephew and successor Friedrich Wilhelm II) he provided the illustrations for Friedrich’s published works. Menzel’s portraits of Friedrich II were appreciated during his lifetime by both Otto von Bismarck and Kaiser Wilhelm II – and after his death by a certain Adolf Hitler. In 1898 he was awarded the Hoher Orden vom Schwarzen Adler (“Order of the Black Eagle”), the first and only artist to do so in what was a prestigious list of monarchs, generals, admirals and diplomats. In receiving the award Menzel was thus elevated to the nobility, allowing him to take the “von” before his surname. Adolph von Menzel died in February 1905 at the age of eighty-nine, and is buried in Berlin. 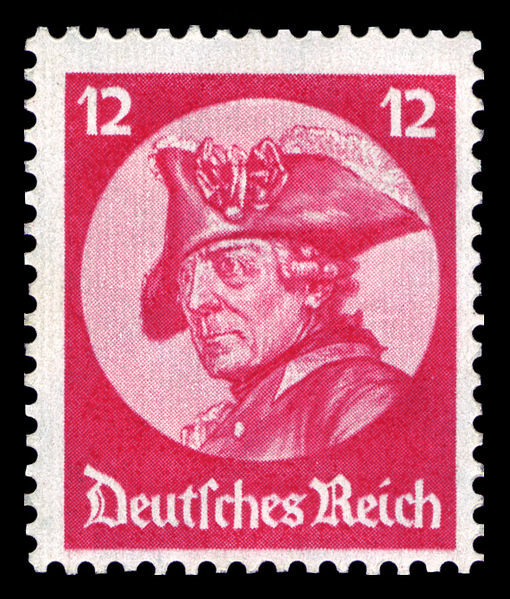 He was later featured on a stamp of his own, the 10pf value from the West Berlin Männer aus der Geschichte Berlins (“Men in the history of Berlin”) set of 1952 (Mi. Nr. 95).